Rosemary Odinga and her brothers Fidel Castro (now deceased) and Raila Junior were born and brought up in the middle class suburb of Kileleshwa and started school at the private Kilimani Junior Academy. Their lives were turned upside down by the abortive coup in 1982. and the crackdown on political dissent in Kenya which followed. Five days before her 5th birthday in Rosemary was separated from her father when he was arrested and detained without trial by the then President Moi. Her father was freed and detained again three times between 1982 and 1990. While Rosemary’s father was in imprisoned, her family’s lifestyle worsened, as her mother Ida (a high school teacher in a government school) was unable earn enough to sustain the lifestyle they were accustomed to. She started school at the Kilimani Junior Academy. Rosemary and her siblings lives would then change for the worse, when their father was detained by the then president, Daniel Arap Moi, during the abortive coup in 1982. Their mother, a teacher in a public school would have to transfer them to a public school to economize. They struggled to get a school that would admit them due to fear of reprisal from the authoritarian Moi regime. It was only with the intervention and help from their grandfather Jaramogi, that Rosemary and her brothers secured admission at the Catholic Church run Consolata Primary School in Westlands. It is while at Consolata that Rosemary converted from the Anglican Church to her Roman Catholic Church. She went on to study in America and while there, Rosemary just like other immigrant students, worked on odd jobs to make ends meet far away from home. Her jobs included housekeeping, mailroom attendant and she also worked as an intern associate. She later worked for three years at Western Union, Texas as a marketing representative for the African Diaspora. She returned home in 2007 after 10 years of study and work in the US, Rosemary founded and served as the chief executive officer of the Raila Odinga Centre (ROC), a foundation focusing on youth and education in East Africa. Rosemary is a young lady with a troubled love-life. It all started in America when she was impregnated by a white boyfriend who ended up dumping her like garbage. By then, she was a student at an American University and her cunning Mzungu boyfriend had promised to marry her. But when she became pregnant, he dumped her and she had to drop out of University for some time. Rosemary nearly lost her life after under-going depression since she loved her white boyfriend so much. However, she under-went a lot of counselling and was able to move on. She was also impregnated by a young city businessman who dumped her. She is now a mother of two daughters but the men behind her pregnancies have all denied responsibility. Sometime back, Mr. Cleophas Ouma was spotted hanging out with former PM’s daughter. It is rumoured that Rosemary enrolled Mr. Ouma to Kenya Polytechnic to study Supply Chain Management. She also bought him a car (Toyota Platz KBB 755J) and relocated him from Satellite area to Kinoo. Most of the time, Cleophas, 31, felt embarrassed to be seen hanging out with Rosemary who is 40 now. A case in point is when she introduced him as “my cousin” during the KCB rally. Ms Odinga suffered the last slap when Cleophas went and married his childhood lover Joanitta Agola from Sare-Awendo, Migori County. It has been hard for her to move on but she was recently spotted with one of the greatest Nairobi political moguls. 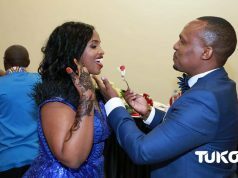 It doesn’t end there, Rosemary Odinga could also be the reason why Kenya Airways Communications manager Michael Okwiri and Former Miss Tourism Debra Sanaipei cancelled their wedding. Secret emails have emerged putting Rosemary Odinga at the centre of their break-up. Their much publicized wedding was expected to happen sometime in 2014 in Zanzibar. Unfortunately, they called it off abruptly citing “irreconcilable differences” as the cause. 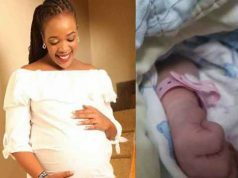 Rosemary gave birth to a daughter who the email claims was Michael Okwiri’s. Debra Sanaipei could not stand Michael’s promiscuous behaviour. She called it quits. Yesterday morning, Rosemary Odinga, who was diagnosed with brain tumour sent a new month message to Kenyans. “A new month signifies new beginnings. If things did not go your way in February, March is offering you a second chance. Make good use of it. I wish you all a blessed Month,” she posted on her Facebook page. She recovering in South Africa after an operation at a Nairobi hospital, a family source has said. The source said the Kibra parliamentary aspirant was on Monday operated on before doctors decided to fly her to South Africa the following day. There were reports that she was taken there for further treatment. She was accompanied by her mother Ida and sister Winnie, the last-born. Also with her in South Africa is the family doctor Oluoch Olunya. Rosemary was admitted to the Aga Khan Hospital, Nairobi for eight days before being flown to South Africa. She had complained of migraines, prompting her hospitalisation for scans that led to the detection of the tumour. 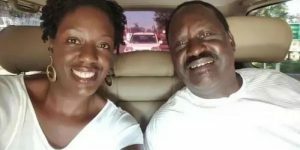 The family of Opposition chief Raila Odinga has dismissed claims that his daughter Rosemary Odinga’s Key Empowerment Foundation had been accepting foreign funds for political activities. The NGO Co-ordination Board Executive Director, Fazul Mohammed, on Tuesday accused Ms Odinga’s foundation of having illegal bank accounts. He said the accounts contained hundreds of millions of shillings. But the Odinga family, through their spokesman Dennis Onyango, dismissed the accusations and termed them “a target against her political career and a move to tarnish her name”. Raila’s family explained that Key Empowerment Foundation Kenya had applied for registration and submitted all the requirements in addition to paying the registration fee, but was yet to be issued with a registration certificate. “Without the certificate, there is no way it could open a bank account and receive the monies alleged. Next articleINTERSTING FACTS ABOUT WINNIE ODINGA YOU DIDN’T KNOW . MEET KIKUYU LADY WHO WANTS TO MARRY WILLIAM RUTO BY FORCE. RACHAEL RUTO ATAMUUMA! !